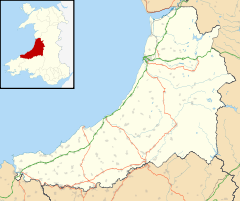 For other examples of the same place name, see Tal-y-bont (disambiguation). Tal-y-bont is a village in north Ceredigion, Wales (also known as Talybont). It is located on the A487 main road, about halfway between Aberystwyth and Machynlleth, in the community of Ceulanamaesmawr. The village stands on the Afon Leri and Afon Ceulan riversides in the area of Genau'r Glyn, at the foot of Ceulan Maes-mawr (383 m). There are many old silver and lead mines and woollen mills surrounding the village. Although silver and lead had been mined in the area since Roman times, it was not until the 19th century that the village began to grow dramatically; many of the terraces were built during this period for workers who migrated to the area. Many of the houses, for example the pharmacy, are listed buildings and therefore maintain many of their original features such as sash windows. There were only 35 houses in Tal-y-bont in 1835; the majority were thatched roof cottages. At one point there were 15 shops, a garage, two banks and three Nonconformist chapels in the village. The Tabernacl was built in 1812, Eglwys Dewi Sant (St David's Church) was built in 1909, and there is also Bethel, Capel yr Annibynwyr (Independent chapel). The Memorial Hall was officially opened on 6 August 1924 in remembrance of those who died during the First World War. Since 1966 the village has been home to Y Lolfa printers and publishers, which is a major local employer, as well as to a garage, a pharmacy, a hairdressers and a SPAR convenience store. There are two pubs in Tal-y-bont, Y Llew Gwyn (The White Lion) and Y Llew Du (The Black Lion). The Tal-y-bont annual agricultural show has been held in the Black Lion's old fields for several decades. tal-y-bont.org This has been hijacked by what appears to be a Japanese page.